Have you always dreamt of flying airplanes? Taking cross-country trips over canyons out west? Or visiting remote islands only accessible by air? 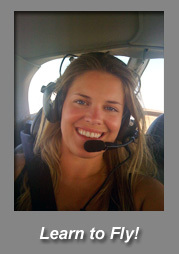 Becoming a pilot can open endless possiblities for travel and exploration. Whether you are an experienced pilot looking to achieve a new rating, or a beginner ready to begin your journey, our FAA certified flight instructors can help you reach your goals. Take a discovery flight and see if flying is right for you! All of our lessons are one-on-one with an instructor, and include hands-on training in our Cessna 172 aircrafts - the most widely used airplane. The FAA requires that a pilot be 16 years old to solo and 17 years old to get a private pilot's certificate. You do not need perfect vision as long as your eyesight is correctable to at least 20/40 with glasses or contacts. So don't wait! 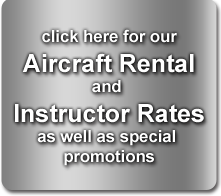 Call us today for a personal tour of our facility and aircrafts or to schedule your Discovery Flight!